Look for your usual EU or US shoe size on our size table and determine what your SHOEPASSION.com size (GB) should be. With the help of our foot measure PDF download, you will definitely find your right shoe size. Please follow the detailed instruction on the PDF. Every pair of shoes in our Goodyear-welted collection is a masterpiece of craftsmanship. According to the traditional art of shoemaking, about 65 individual parts are assembled by experienced master craftsmen in around 210 working steps in order to create these graceful and durable men's shoes. The experience for the wearer, the elegant look and, last but not least, the quality of this extremely elaborate construction do credit to its design, which is praised worldwide as the supreme discipline of shoemaking. Do not miss your desired product! Just register your email address in the contact field below. We will inform you as soon as the product is available again. Please note that this is not a pre-order. 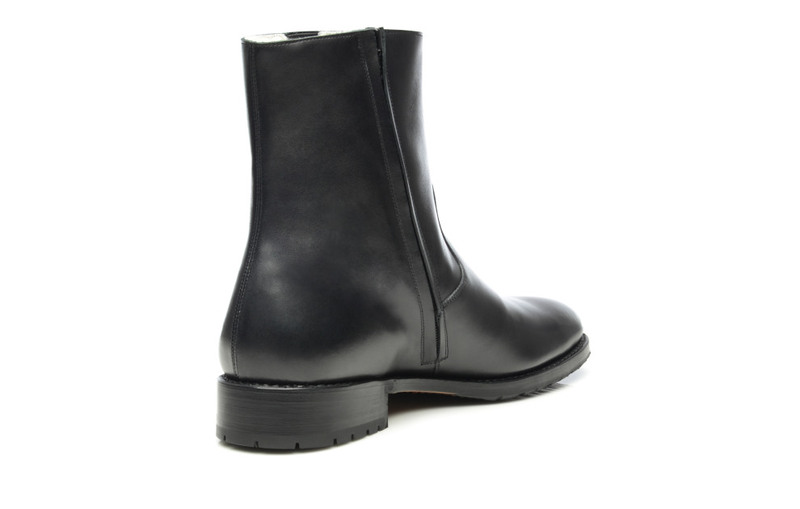 This is perhaps the broadest boot group of all – the classic winter boot. Our No. 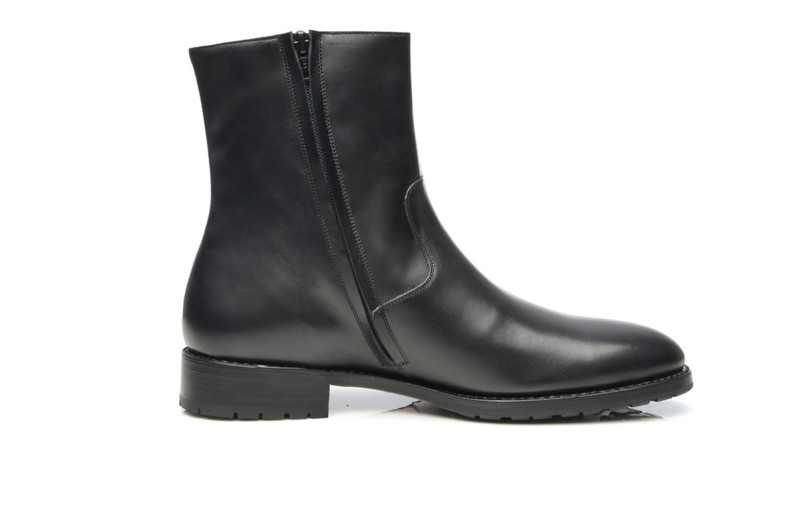 690 is an elegant men’s boot in black. 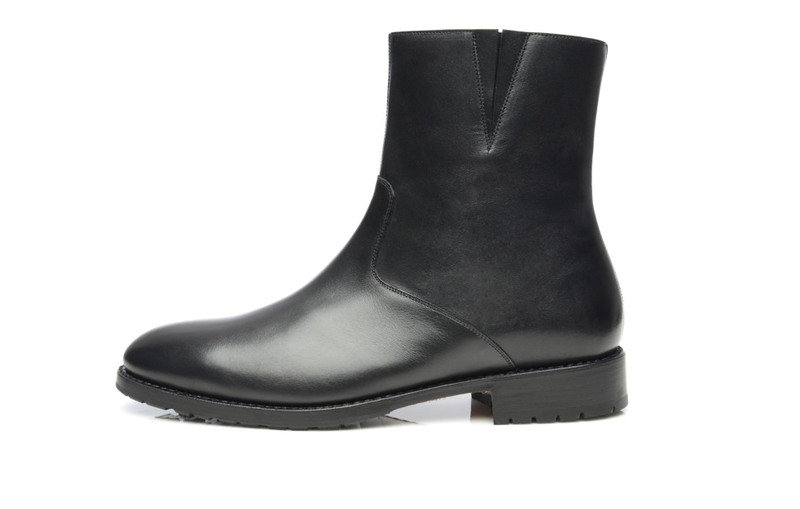 Similar to the Chelsea style, this winter boot guarantees a stylish appearance during inclement weather. Originally born from the simple need for survival, the structure and style of waterproof winter boots made of animal skin have thankfully evolved over time. The primary goal of protection against winter’s woes remains the same though and no man should be without a sturdy pair of winter boots past December. The zip fastening and elastic panel on the outside facilitate entry and allow the shoe to stretch when taking it on or off. 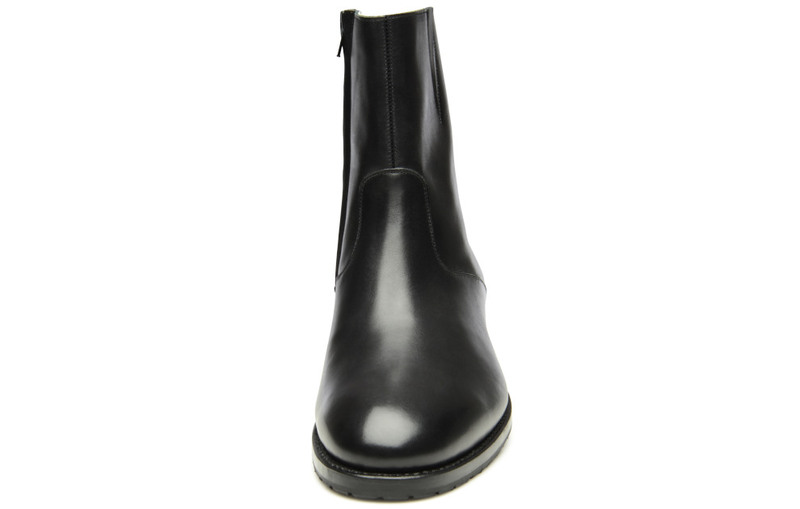 The soft lambskin lining promises comfortable warm feet during the whole way from the office to the walk home at night. 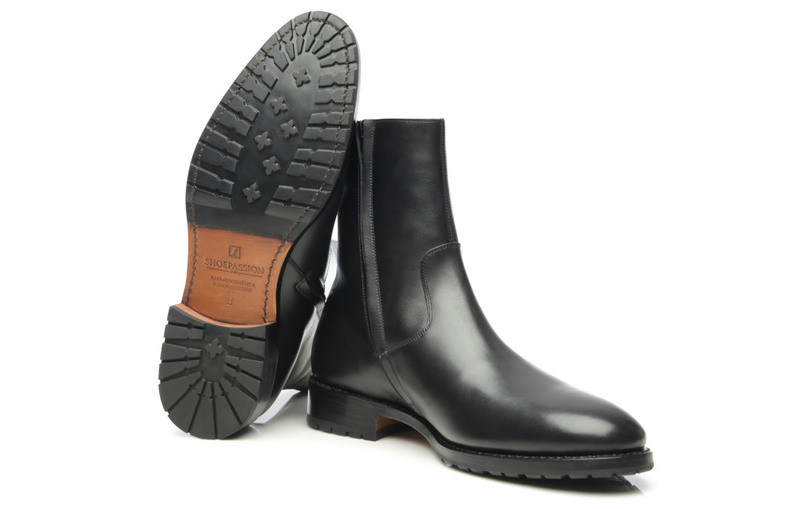 In addition, the welted rubber outsole of our winter boots offers the perfect protection on wet and icy footing. Our No. 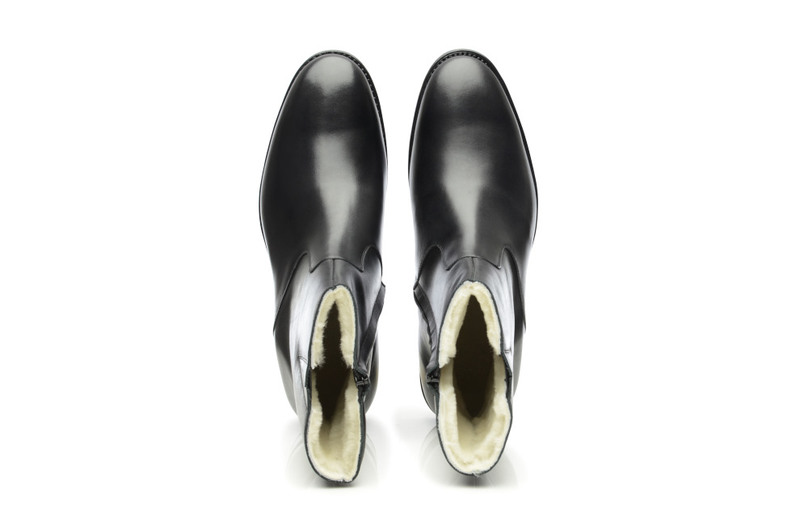 690 is bound to the tradition of an elegant and classic Chelsea Boot. It looks great with a suit, especially with trousers in dark colours, and cuts a fine figure with jeans as well. Boots boast a high reaching vamp of almost 5 to 10 cm above the ankle. 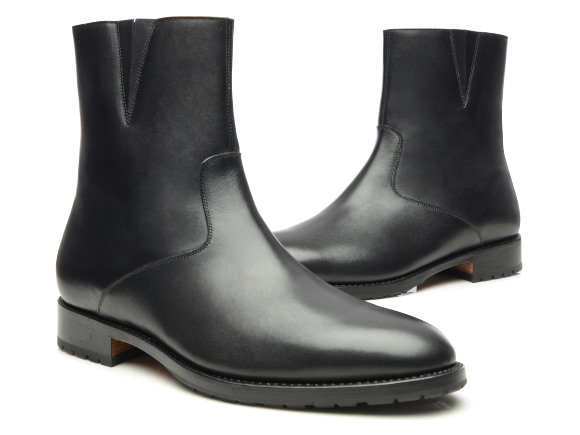 They are more robust than their smaller cousin, the classic ankle boot. 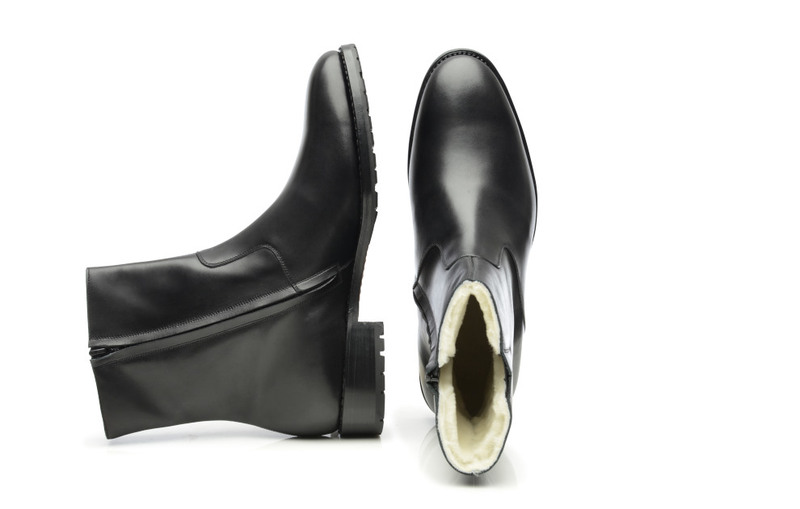 This elegant Oxford Boot in black offers a great protection against inclement weather. The standard British last form. Subtly and elegantly narrows at the front of the shoe, without sharply rising from the ground. The average width at the ball of the foot provides a great fit for average feet. This shoe’s upper boasts premium, medium-soft calfskin. The technical term for this type of leather is ‘French calf.’ This type of leather is known for its flexibility, fine texture, and soft grain. Enjoy warm feet and excellent traction in winter, thanks to soft lambskin lining and a stabilizing, military-style rubber lug sole. Perfect for cold, wet weather. The gold standard when it comes to shoe manufacturing. 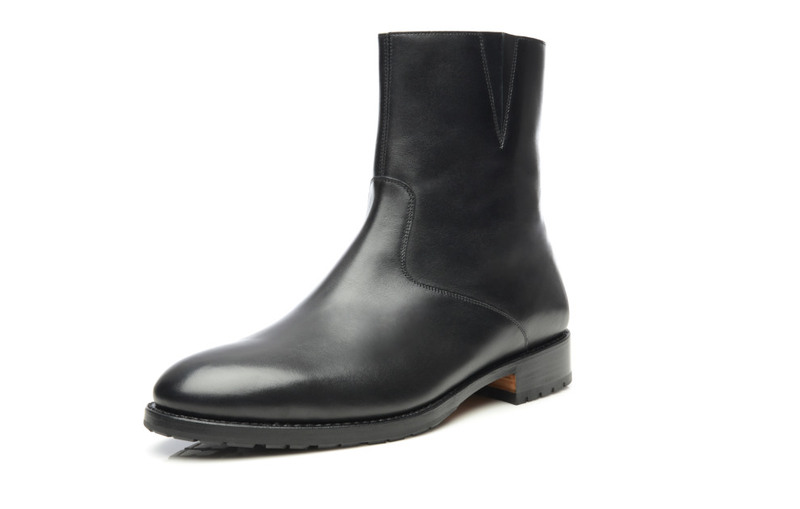 Goodyear welting is a painstaking process that involves stitching the shaft and outsole to a thin strip of leather. Shoes made this way are extremely stable, durable, breathable, and easy to repair. Mass-produced shoes are glued together on assembly lines. 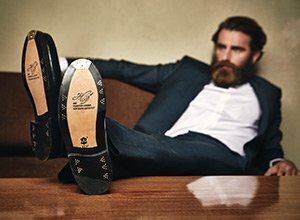 All of our premium, full-leather shoes, on the other hand, are handcrafted to the finest standards of quality. You can see and feel the difference. 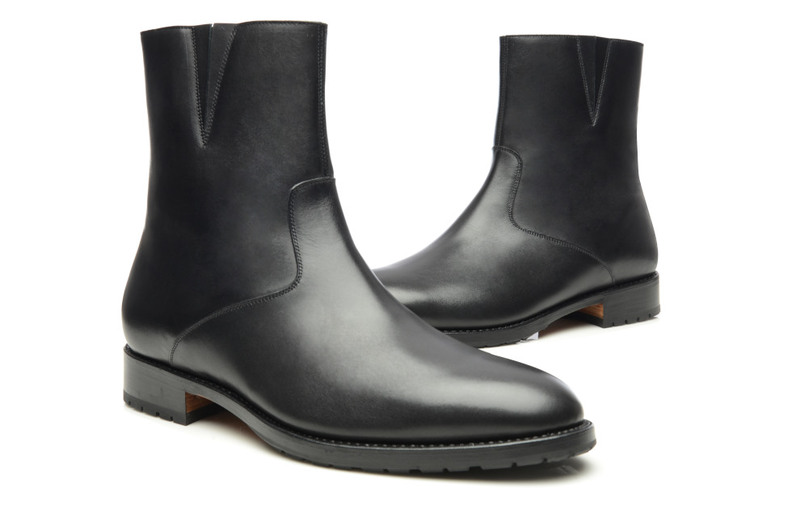 The high quality of these shoes is reflected in their high leather content. Their uppers, lining, insoles, and outsoles are made from the finest leather. They even have leather heels, made by painstakingly stacking thin layers of leather on top of one another. These shoes consist of roughly 65 separate parts. They took about 210 steps to assemble. We rely upon premium materials and traditional production methods to ensure that our footwear is of the absolute highest quality. These shoes come equipped with a so-called "gentleman's corner". This is a small notch cut from the inside corner of the heel. This has a practical purpose—it prevents your trouser leg from catching on your shoe. 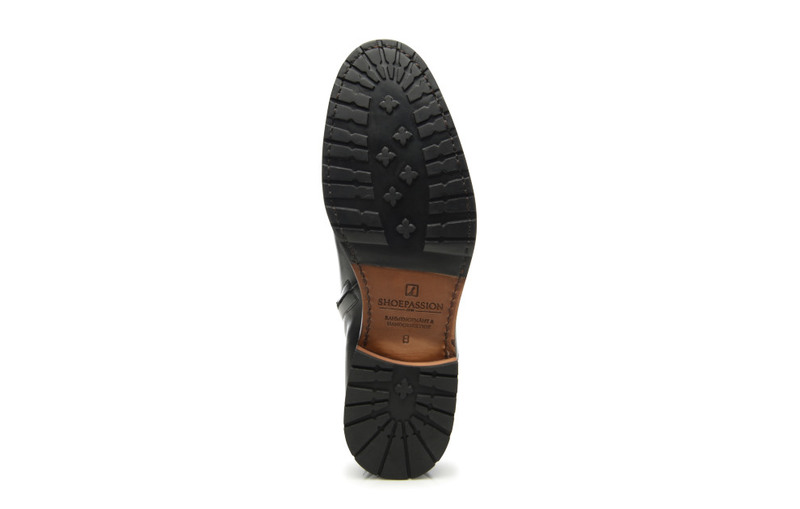 This shoe boasts a high proportion of leather, and has been assembled without the use of adhesive bonding—both of these factors ensure proper air circulation and prevent moisture from penetrating the surface. Dry, well-ventilated feet are healthy feet. Of course, our focus is on your new pair of shoes. But to underline our passion for our products, we enclose a few extras in your shipment. We hope that sparks your excitement about your new footwear. Our passion for our products is reflected in their packaging. 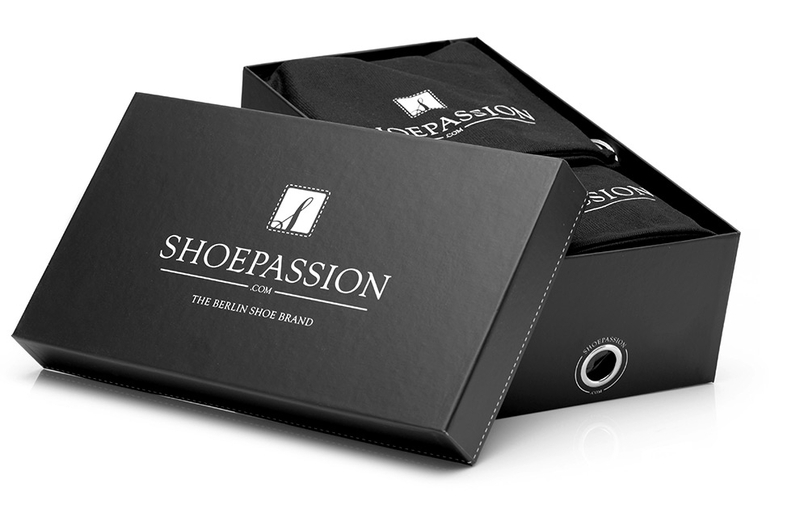 All of our shoes come in an elegant black shoebox emblazoned with the SHOEPASSION.com logo. Said shoebox is easy to open, thanks to a special opening on the side, and comes with a note on our philosophy. These shoes come stored inside two shoe bags, packed into a shoebox. Shoe bags are a great way to maintain their condition—they protect your footwear from soiling and scratching. They also let you transport your shoes in style. Goodyear-welted shoes last far longer than mass-produced models. A dedicated cleaning and care routine is an indispensable part of keeping your shoes in mint condition. An introductory guide to shoe care is included with your order. "THE WORLD OF SHOES IN THE DELICATESSEN OF THE 21ST CENTURY." While most of our peers in the shoe industry are still unable to guarantee shoes that are »made in the EU«, we’re able to prove that our shoes are just that. We use leather from France and Germany, manufacture our shoes in Spain, and run distribution and logistics in Germany—our shoes are 100% made in Europe. For many companies, all that matters are the profits; they fail to take notice of the disastrous conditions under which hides are taken in Bangladesh, or shoes are manufactured in China. We turn instead to traditional European tanneries and Spanish craftsmanship, to the benefit of man and nature alike. Our promise: since you’re purchasing directly from the manufacturer, you’re spared the typical high margins. You’re also spared the additional cost of paying for a brand name. Thanks to our advantageous wide reach and our low cost structure, we’re able to offer sensationally low prices. From the provenance and treatment of the leather we use, to the conditions in our Spanish factory, to delivery with our logistics partner, we don’t leave any stone unturned. We provide copious, transparent information on every step in our supply chain. SHOEPASSION.com was founded by a pair of shoe lovers, and each and every employee focuses on satisfying our shoe-loving customers. Whether it’s graphic design, sales, marketing, editorial, or customer service, we handle all aspects of our business internally, ensuring our total control over all processes. We’re also owner-managed. Your opinion is important to us; that’s how we define our business. If you’d like to express your satisfaction with our products and services, let us know. You can read reviews from other customers as well as experts in the shoe industry on the SHOEPASSION.com site. Your satisfaction is our top priority! Lots of brands are quick to conceal the production methods behind their products, as well as the origins of the materials they use. We, on the other hand, have nothing to hide. From the very beginning, our products have been »Made in the EU«, in the classic sense. As such, we treat both our fellow man and the natural environment in a way that’s ecologically sustainable and ethically responsible. Each step on our supply chain is entirely transparent for you to see—that’s a promise we’re happy to stand by.